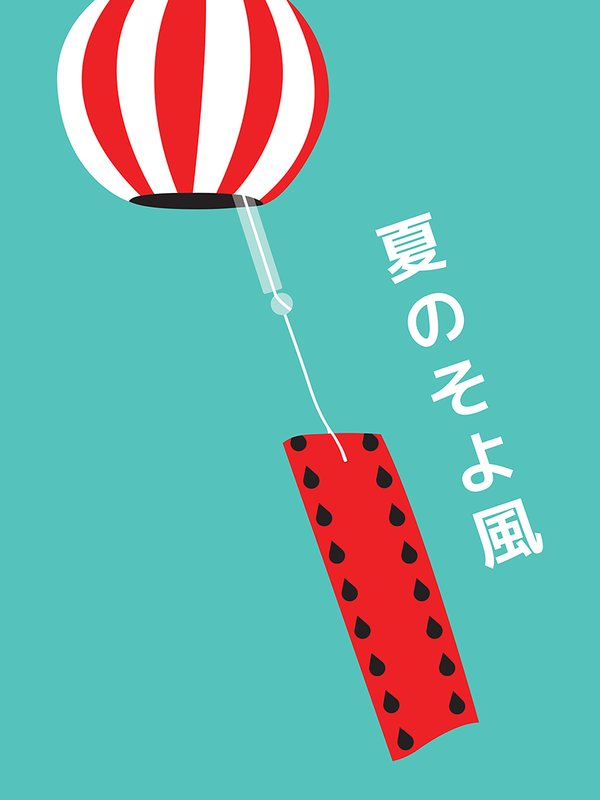 Fūrin (ふうりん・風鈴) is a traditional Japanese glass windchime here painted in a modern watermelon pattern, a staple summer fruit in Japan. In Japanese culture the windchime has long been regarded as a symbol of good luck, as the sound of the bell ringing is thought to ward off lurking evil spirits. It is a beloved summer decoration often displayed in every window or porch. On a hot summer’s day, the chime is thought to have a soothing effect, as it is an indication of a wind blowing through the window. Our windchime print is meant to remind us that those summer days are just around the corner. The print’s bright colours will warm up your space, and bring back the joy of the crisp melodic sound of the windchime, when rattled by the gentle movement of the air. The Japanese text, 「夏のそよ風」 (“Natsu no soyokaze,” “The gentle wind of the summer”), captures this very essence.